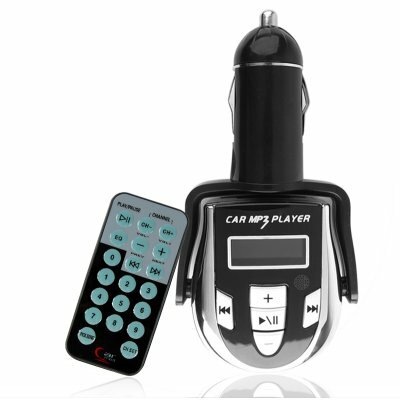 Successfully Added Wireless Car MP3 FM Modulator - USB + SD Card Digital Music to your Shopping Cart. MP3 and WMA player with a wireless FM modulator / transmitter for playing digital music directly from the player onto your car's own audio system, and featuring the ability to play directly from a USB flash disk using the USB port or a 2GB SD memory card using the SD memory card reader. With this portable and cool looking car gadget, take your music with you wherever you and your car goes. A dot matrix LCD screen will easily tell you which song is currently playing as well as which of 15 different FM channels the MP3 player is transmitting on, and with the included wireless remote, control is easy and fast. For the convenience of playing your music with your cars own pimped up sound system whenever you want to, without the hassle of changing CD's or a new car audio system, the CVEYH-FM26 MP3 player can not be beat.